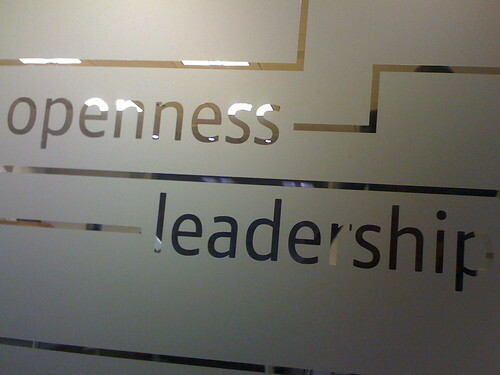 Those of you who know me know I’m pretty keen on openness. The hypocrisy of using a Powerbook for my daily work and keeping an iPhone in my pocket continue to not be lost on me, but I want to spend a few lines on the power of openness. Imagine if you will, a company developing a new laboratory device. The device is amazing and for early-access partners exceeds expectations in terms of performance but the early-access community feeling is that it’s capable of much more. The company is keen to work with the community but wants to retain control for various reasons – most importantly in order to restrict their support matrix and reduce their long-term headaches. Fair enough. To this end all changes (and we’re talking principally about software changes here, but applies equally to hardware, chemistry etc. too) have to be emailed to the principal developer before they’re considered for incorporation into the product. Let’s say the device was released to 20 sites worldwide for early-access. Now each one of those institutes is going to want to twiddle and tweak all the settings in order to make the device perform for their experiments. Then something cool happens. The community sets up their own online exchanges to provide peer-to-peer support. Warranties and support be damned, they’ve managed to make the devices work twice as fast for half the cost of reagents. They’re also bypassing all the artificial delays imposed by the company, receiving updates as quickly as they’re released, and left with the choice of whether to deploy a particular patch or not. So where’s the company left after all this? Well, the longer this inadvertent exclusion of community continues, the further the company will be left out in the cold. The worse their reputation will be as portrayed by their early-access clients too. Surely this doesn’t happen? Of course it does. Every day. Companies still fear to engage Open Source as a valid business model and enterprising hackers bypass arbitrary, mostly pointless restrictions on all sorts of devices (*cough* DRM!) to make them work in ways the original manufacturer never intended. So.. what’s the moral of this story? If you’re developing devices, be they physical or virtual, make them open. Give them simple, open APIs and good examples. Give them a public revision control system like git, or subversion. Self-documentation may sound like a cliché but there’s nothing like a good usage example (or unit/functional/integration test) to define how to utilise a service. If your devices are good at what they do (caveat!) then because they’re open, they’ll proceed to dominate the market until something better comes along. The community will adopt them, support them and extend them and you’ll still have sales and core support. New users will want to make the investment simply because of what others have done with the platform. Ok, so perhaps this is too naieve a standpoint. Big companies can use the weight of their “industry standards”, large existing customer-base, or even ease-of-use to bulldoze widespread adoption but the lack of openness doesn’t suit everybody and my feeling is that a lot of users, or would-be-users don’t appreciate being straight-jacketed into a one-size-fits-all solution. Open FTW!